This is a White Bean Chicken Chili Recipe which also has chickpeas. It’s a lighter version of our favorite beef and bean chili, that doesn’t skimp on heartiness or flavor. 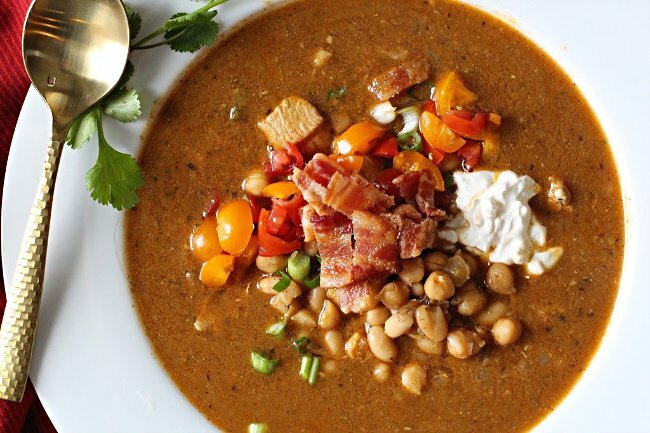 Topped with a dollop of sour cream, chopped cherry tomatoes, and pieces of chopped bacon, you’ll find this to be a very rewarding chili recipe. You’re going to love this recipe and especially if you’re not a beef eater. 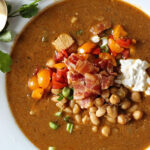 Chunks of chicken, white beans and chickpeas come together for a hearty flavorful chili recipe. 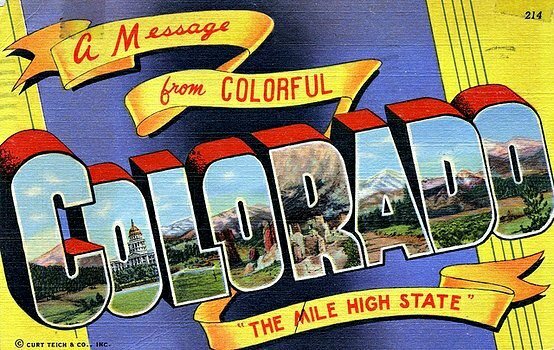 We’ve most certainly been having soup, stew and chili weather here in Colorado. With a new snow storm rolling through about every two days, the snow has been piling up and the cold has been chilling our bones. Perfect chili weather, and perfect to spend time in the kitchen on a new version of chili. This white bean chicken chili recipe was a hit in our house. Last Summer on my trip to Palombo’s Farmer’s Market, I grabbed a bag of about every dried bean they offered. My pantry is still overflowing with these fresh Colorado grown beans, so I couldn’t think of a more perfect time to incorporate them into a hearty chili. I couldn’t resist including this photo. Of course I wanted to play in those big bins of beans. I purchased quite a lot of chickpeas and I’ve been making hummus with them all Winter. Why not add them to a white bean chili? Their beautiful bit of crunch proved to be a great addition to one of our favorite winter meals. When the Ranch Hand was done with his first bowl of this unique version of chili, his comment was simply “that’s a ten”. The crockpot is my tool of choice to cook dried beans to use in any type of soup. It’s easy. Just rinse the beans and pick through them and remove any discolored or shriveled beans. Place them in your crockpot and cover them with one inch of water. Throw in a couple of bay leaves. Add one heaping tablespoon of lard to the pan. This makes them creamy. 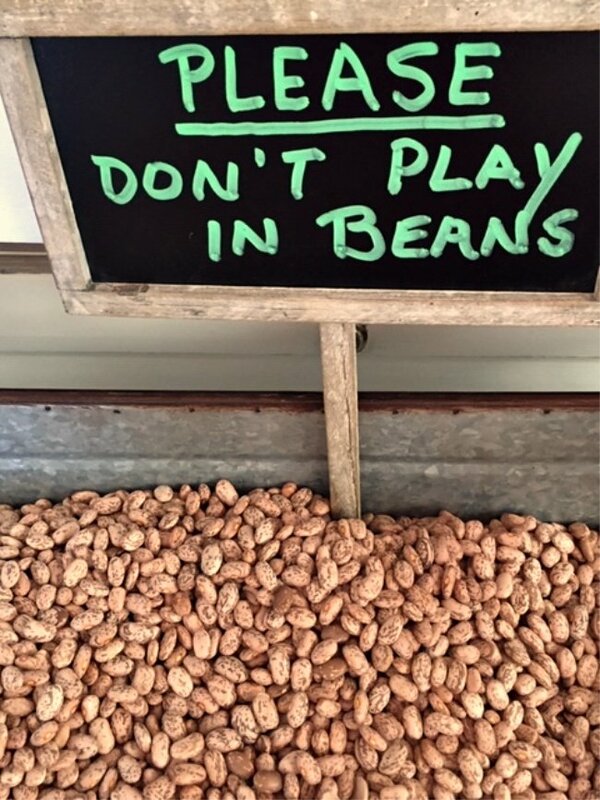 Don’t salt the beans. Salt can keep the beans from cooking to the soft stage that you’re after. Cook on low for 5 – 7 hours. The time will vary with the freshness of the beans. The beans I buy at our farmer’s market are this year’s harvest. They’re fresh and they’ll cook soft in 4 – 5 hours. Beans purchased at the grocery store are more than likely older and will take longer to cook. So, just check them every once in awhile to know when they’re done. When the beans are soft, drain them and remove the bay leaves. Proceed with your soup, stew or chili recipe in the crockpot, following recipe instructions, or complete the meal stove top in a Dutch oven. Ratio: one cup dried beans will yield three cups cooked beans. 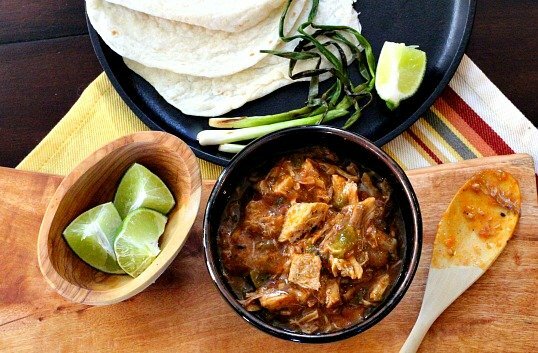 Of course you can use canned beans for this recipe. Ratio: one 15-ounce can of beans equals the same yield as 1/2 cup dried beans. I love my crockpot for beans. It’s a great hands-off method for cooking beans tender and flavorful. And I hope you try my lard method. It’s a great trick for creamy, flavorful beans. The toppings are an important addition to this chili recipe. Adding color and flavor, don’t forget to offer sliced green onions, sour cream, bacon bits and chopped multi-colored cherry tomatoes. 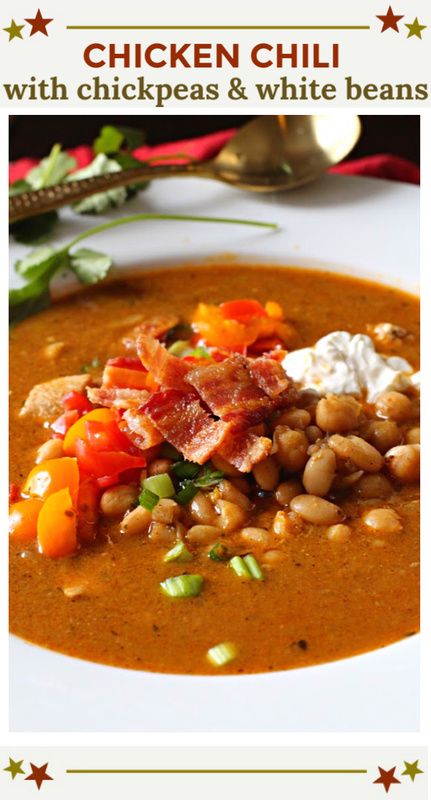 I hope you give this Chickpea White Bean Chicken Chili recipe a try and if you do, please come back and give the recipe a star rating and leave a comment about your experience with the recipe. And if you have a favorite soup or chili recipe using chickpeas, let me know, I’d love to give it a try. White Bean Chicken Chili Recipe with Chickpeas. A lighter version of beef and bean chili, that doesn't skimp on heartiness or flavor. Very rewarding chili in flavor and textures. Rinse and pick through beans and chickpeas and remove any misfits. Place beans and chickpeas in a crockpot. Cover with enough water to cover my 1 inch. Soak beans overnight. The next morning, add a tablespoon of lard (or vegetable oil) and the bay leaves. Cook on low until beans are tender. Depending on how fresh the beans are, this could take anywhere from 5 - 7 hours. Heat 2 tablespoons of oil in 6-quart soup pot or Dutch oven over medium-high heat until hot. Pat the chicken dry, and season with 1-1/2 tsp. salt and 3/4 tsp. pepper. Cook half of the chicken until browned, 2 to 3 minutes per side. Add another tablespoon oil to the pot, and brown the remaining chicken; transfer to the plate along with any liquid from the pot. Add the remaining 1 tablespoon of oil and the onion to the pot. Sprinkle with 1/2 teaspoon salt and cook over medium heat, stirring occasionally, until softened and lightly browned, about 5 minutes. Stir in the garlic and the bell pepper and jalapeno. Cook, stirring, until fragrant, 1 to 2 minutes. Add the chili powder, Mexican oregano and dried onion flakes. Turn the heat down to medium low. Add beans and chickpeas. Cover and simmer, stirring occasionally, until the chicken is tender, about 30 minutes. If the chili gets too thick, thin it with a little water. Stir in the lime juice, and season with salt and pepper to taste. You can use canned beans and chickpeas for this recipe. Substitute 3 15 ounce cans of each, rinsed and drained. That looks really good LA and you don’t find many recipes calling for lard – I think we may even have some at home. As for the snow and cold, think Tucson. I don’t often cook with dried beans but your tips will motivate me to give it a try. Chili in the crock pot is what gets me through the winter! i love it for lunch and dinner and don’t mind leftovers. Yours looks so good. Love chicken chili! The chickpeas are a wonderful addition — a bit different, and their flavor really works in chili. Very creative — thanks.